No matter your goal, we have the perfect guitar course for you. Each course can be fully tailored to get you the results you want. Follow simple, easy-to-learn lessons and courses to grow your guitar knowledge. Using a mix of lessons, videos, notation and live performances, our Guitar Masters will teach you the proven best way to learn the guitar. Put your new guitar skills into practice immediately in a fun, friendly learning environment under expert care. Play with other guitarists at your skill level. Learn all the secret tips and tricks used by experienced players. Now for the real fun! Play your favourite songs using using the skills and knowledge you've picked up. Once you've learnt to truly play the guitar, you're never going to want to put it down - and it takes less time than you'd think! The real guitar masters don't stop once they've learnt to play a style or a song. Take it to the next level by creating your own music, teaching other students and performing in public in a band or as a soloist. Ready to get real results? With the right guidance, learning the guitar is easier than you'd think. Mastering an instrument is a journey. We're here to make sure you get to the top smiling. I'm Ben Plant, professional guitarist and teacher. I'm a touring musician who's taught hundreds of guitar students (of all ages and skill levels) almost everything I've learnt over the past two decades about playing the guitar. But what I've done doesn't matter. What really matters is what our team of guitar masters and I can do for you. Our specialist guitar courses are designed to help you reach and exceed your guitar goals. Want to play in front of 1000 people? I've done it, and we can show you how to get there. Want to become a teacher yourself? Awesome! We'll help you develop your own career as a professional musician. Maybe you're more interested in learning a few chords to play for your kids (or lucky significant other)? We can teach you to become a strumming serenading extraordinaire. 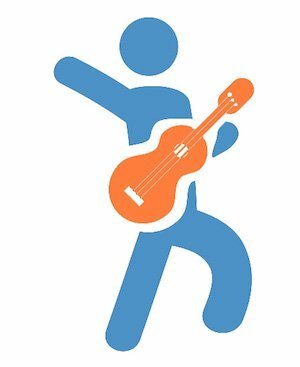 No matter your musical challenges, you can become the guitarist you've always wanted to be. How Can I Learn the Guitar? Have you tried to follow along with Youtube lessons? Have you tried to download free tabs off the internet? Maybe you've even bought a few beginner books to get started? If you answered yes to any of these questions, you've tried guitar lessons the hard way. This is the way many people first try to learn the guitar, and quite frankly, it doesn't work for 99% of beginner guitar students. It leads to frustration, a sense of being overwhelmed and - most importantly - very limited results. Ever had a guitar lesson with a teacher? How did you find it? Trick question - I know because you're here that you didn't get the results you were after. So why do so many guitar students find their typical guitar lessons don't work? Simple - you can't expect total guitar mastery to come out of a poorly organised, unstructured 30 minute lesson every other week. But there is a better way. Save yourself the time and effort - learn from a teacher who will get you results, fast. By far the easiest, fastest path to total guitar mastery is through a customised, expert guitar course. Don't settle for one boring guitar class a week. Don't settle for a bunch of videos. Only settle for guitar lessons that get you to where you want to be as a player. When you begin your journey with us, you'll not only make rapid progress, but you'll have a lot of fun along the way! For anyone serious about guitar lessons, Option 3 is the only way to go. Our guitar studio is located just off Maroondah Hwy in Ringwood, behind the McDonalds and opposite Ringwood Square.